Since the 1920’s Wichita has laid claim to the title of “Air Capital of the World” without much of an argument from any other community on the planet. After all, we’ve built most of the world’s airplanes here. But, for much of the past half century, more of those airplanes show up in the same place during the same week each year at a small town in Wisconsin that is otherwise known for baby and child wear. Of course, I’m referring to Oshkosh, by gosh! Every summer since 1970 literally thousands of airplanes turn Oshkosh’s Wittman Regional Airport into the world’s busiest. They’re parked on virtually every available patch of grass and open ramp space and the adjacent fields and would-be pasture or crop land becomes America’s busiest RV park and campground. Oshkosh’s population balloons from 66,000 to over half a million for most of the month of July. Wichita doesn’t abdicate the “Air Capital” title during the annual Experimental Aircraft Association AirVenture each summer—it just sort of “lends” it to Oshkosh. In fact, one of our own residents, Jack Pelton, is Chairman and CEO of the host organization, EAA, so the festivities in Wisconsin have a strong Wichita connection. Needless to say, our local companies are extremely well represented. GlobalParts.aero has an impressive presence with an exhibit on the grounds, a display in one of the hangars, and the company hosted a party for attendees on Wednesday evening, as well. In addition to displaying a wide array of products, including Gill batteries and Zodiac oxygen masks which it currently has in inventory at multiple sites worldwide, the company also displayed a beautifully restored Meyers 200 airplane at its exhibit and announced that it has created a Meyers 200 Racing Team. GlobalParts.aero owns the type certificate and production rights to the Meyers 200. Three of the single engine airplanes entered the AirVenture Cup Race this year and swept the first three spots in their category. Textron Aviation also showed off their new single engine turboprop and announced it will be called the Denali, Yingling Aviation unveiled an enhanced remanufactured Ascend 172 with Garmin 500 avionics installed, BeLite Aircraft showed off its latest model, the Skydock, and RC Allen Instruments and Kelly Manufacturing were among Wichita exhibitors on hand. On the ground, it’s the same thing, only you find yourself following all manner of high profile campers and RVs. You can’t see over or around them to read signs or pick out landmarks I was trying to go to Parking Lot B but I ended up on Highway B headed to Fond Du Lac instead. Once we got to the parking lot we stuffed our things in a backpack and headed to the front gate where a vast army of volunteer security people checked them for contraband. On the first day, I took my computer, a camera, a spare battery, a change of shoes, an umbrella, sun screen, a pair of binoculars, a rain poncho and some snacks. It took me 20 minutes to get to the checkpoint and 5 minutes to get everything in and out of the pack. By day 3, I had my cell phone and some Chapstick. I even left my wallet at home; I loaded a credit card on my smart phone and stuck a $20 bill in my sock. I learned to operate on the “Rule of 2”: After 2 days of carrying “necessities,” anything that can’t be consumed in the 2 hours is probably 2 heavy 2 carry 2 far! There are no such things as complete and well-understood conversations at EAA after about 12:30 PM. That’s when performers and aircraft start taking off in large numbers to position themselves for participation in the afternoon’s air show performances. Whether they’re solo aerobatic performers or part of the elaborate aerial ballets that range from mass fly-bys featuring every known T-33 in the Western Hemisphere to full re-enactments of the attack on Pearl Harbor punctuated by massive explosions of ordnance on or near the active runway, every demonstration flown at AirVenture between 1 PM and 5 PM each afternoon generates decibel levels that can be measured in Milwaukee, 75 miles away. The interruption leaves nothing to do except buy ice cream–two large scoops in a waffle cone cost the same as a seat on the board of Ben & Jerry’s, but it’s irresistible on a hot day. The ice cream melts faster than it can be eaten but it provides a reasonable means of tracking children if you know what flavors they ordered. Just follow the drips! Even the sky divers are loud because they have PA announcers who talk constantly. Thanks to technological improvements, the aerobatic pilots can also provide commentary on their routines while they’re flying them–but it’s done while they’re pulling 3Gs and over a headset that’s fed through the public address system so it’s about as easy to understand as the drive-through at a McDonald’s during a thunderstorm! 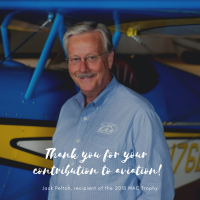 Attending EAA AirVenture is like going to a State Fair on steroids that has been invaded by gigantic buzzing insects with announcers who are occasionally interrupted by lumbering jet propelled cities with wings; they dwarf all the other flying traffic. This year the massive attractions included the Martin Mars water bomber which was damaged when it actually scraped the bottom of Lake Winnebago while scooping up water for a demonstration of its ability to dump massive quantities of water (and apparently, lake bottom) on a specified target. In this case, the target was the runway at Wittman Regional Airport, where the assembled spectators who had escaped the afternoon rain showers the previous afternoon, were provided with “bonus coverage” when the giant water bomber treated them like front row audience members at a “Shamu” show at Seaword and doused them with 70,000 gallons of lake water! The other BIG attraction–as in larger than any of the other aircraft–was the C5-A, which was parked on Boeing Centennial Square with both its nose and tail access ramps opened for public viewing. 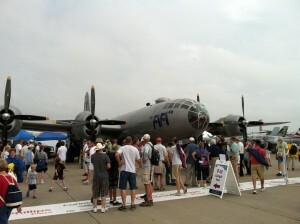 AirVenture attendees approaching on Celebration Way could see through the giant transport. From a distance it looked like the Holland Tunnel with wings!Once EAA is over, Oshkosh returns to a semblance of normal or what for Wisconsin is considered normal. That’s where cheese, beer and the Packers replace airplanes as the most prominent things on the minds of the locals. Every Thursday at around noon, fresh cheese curds or “Squeaky cheese” is delivered to specific grocery and convenience stores (and even a few select gas stations). The knowledgeable cheesehead are on site waiting when the delivery men show up. They happily consume the cheese curds, which squeak audibly when chewed, head off to the local pub for a couple of Milwaukee’s finest, to watch coverage of the Pack on the early news and remind each other that they own a couple of shares of stock in the team. Oh, and they relinquish their month-long title as the “Air Capital of the World” and return it to its rightful owners in Wichita…at least until the same time next year!